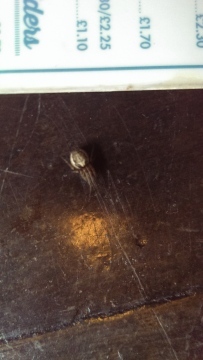 This little fella was hanging from a lampshade in work today and piqued my interest. 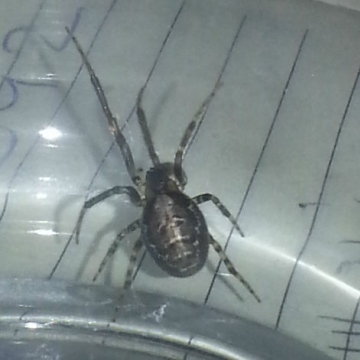 I'm not a spider expert but have a general interest in the natural world and the markings look like quite distinctive. I've had a trawl through lots of sites showing images but can't find anything similar. If it turns out to be the 'common or garden house spider' please don't laugh! This is the very common and widespread orb web spider Zygiella x-notata, present in most houses and gardens, living on fences and under eaves, window frames etc, and even car wing mirrors. It is harmless to humans. The harvestman looks interesting, but I don't think it will be possible to get to a definite species without the actual harvestman. 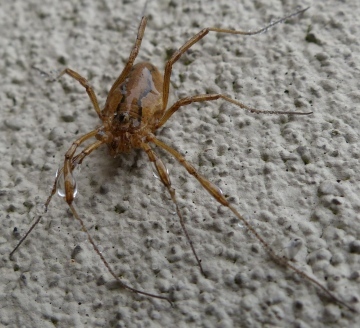 With the new picture uploaded, I would revise my identification as probably Meta menardi, but the two Meta cave spider species cannot be reliably identified to species from photographs. It seems likely that Meta menardi usually has clearly annulated legs, as in the picture, and M. bourneti not annulated or far less prominent. However we do not know how reliable this difference in appearance is in the identification between the two species. I found this on the wall of the restaurant at the summit of Snaefell. A mountain in the Isle of Man. Can anybody identify it? The water drops on it are due to the cloud which surrounded the Summit at the time the photograph was taken. Re: Goldenrod or Common Crab spider? Thank you for your comprehensive and definitive answer on our confusion over the English name for this spider. Your answer highlights, how well intentioned attempts at definitions by non specialists, always requires the input of the expert view. The two photos you have uploaded are the crab spider Misumena vatia, and any confusion over 'common crab spider' or 'goldenrod crab spider' is due to the fact that there are no widely accepted English names for the vast majority of British spiders - it is the binomial taxon name Misumena vatia under which the taxon was described which defines the species in question. English names simply cause confusion, especially where there is no set agreed name or, as in this case, different non-specialists argue over what might (or might not) be the 'correct' English name. The answer is that there is no correct English name. Incidentally neither suggested English name makes any sense - there is no special connection between Misumena vatia and golden rod (indeed I would be surprised if this spider ever used golden rod as a flower where it waited for prey) and as can be seen from the summary for this spider and distribution map at the Misumena vatia summary page, it is very far from 'common' except in some southern parts of the country. Goldenrod or Common Crab spider? Hi, New user to this forum here and have been told that this is best place to raise our query.